Griha pravesh is one of the popular residential projects in Asansol & Durgapur. griha pravesh offers thoughtfully constructed 2BHK & 3BHK Villas & 3BHK Duplex with basic amenities for the comfort of residence. Adding to this situated close to the market, hospital and many educational institutions. First things first, its spectacularly luxuries, offering on unparalleled lifestyle in one of the coveted localities in Asansol & Durgapur. Address: Above ICICI Bank,Durga Mandir, Ushagram, Asansol, West Bengal, India. 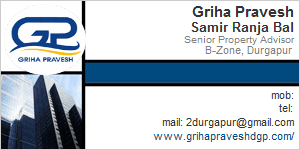 This Builder Profile page for "Griha Pravesh" has been created by PropertyWala.com. "Griha Pravesh" is not endorsed by or affiliated with PropertyWala.com. For questions regarding Builder Profiles on PropertyWala.com please contact us.